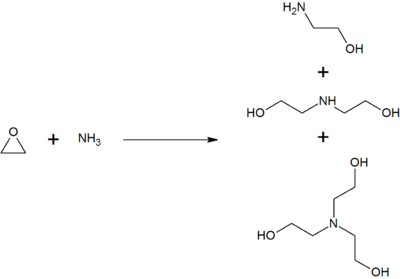 Triethanolamine aka Trolamine (abbr. as TEOA to distinguish it from TEA which is for triethylamine) is a viscous organic compound that is both a tertiary amine and a triol. A triol is a molecule with three alcohol groups. Triethanolamine is a strong base. Approximately 150,000 tonnes were produced in 1999. It is a colourless compound although samples may appear yellow because of impurities. Triethanolamine is produced from the reaction of ethylene oxide with aqueous ammonia, also produced are ethanolamine and diethanolamine. The ratio of the products can be controlled by changing the stoichiometry of the reactants. Triethanolamine is used primarily in making surfactants, such as for emulsifier. It is a common ingredient in formulations used for both industrial and consumer products. The triethanolamine neutralizes fatty acids, adjusts and buffers the pH, and solubilizes oils and other ingredients that are not completely soluble in water. Triethanolammonium salts in some cases are more soluble than salts of alkali metals that might be used otherwise, and results in less alkaline products than would from using alkali metal hydroxides to form the salt. Some common products in which triethanolamine is found are sunscreen lotions, liquid laundry detergents, dishwashing liquids, general cleaners, hand sanitizers, polishes, metalworking fluids, paints, shaving cream and printing inks. Various ear diseases and infections are treated with eardrops containing triethanolamine polypeptide oleate-condensate, such as Cerumenex in the United States. In pharmaceutics, triethanolamine is the active ingredient of some eardrops used to treat impacted earwax. It also serves as a pH balancer in many different cosmetic products, ranging from cleansing creams and milks, skin lotions, eye gels, moisturizers, shampoos, shaving foams, and so on. TEOA is a fairly strong base: a 1% solution has a pH of approximately 10, whereas the pH of skin is less than pH 7, approximately 5.5−6.0. Cleansing milk–cream emulsions based on TEOA are particularly good at removing makeup.